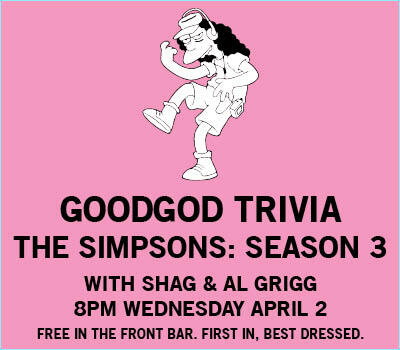 Sydney’s longest running Simpsons Trivia night is back! This time it’s all about Season 3 – a run packed with classics like Stark Raving Dad, Homer At Bat, Flaming Moe’s and heaps more. As always, it’s hosted by Shag & Al Grigg, and is sure to be popular! First in, best dressed, with first questions from 8pm. Grab a crew, get in early for primo seats, and win some prizes!